Image provided by http://www.sxc.hu/. Used with permission. There are things that I don’t get. One thing that I don’t get is theft. Okay, I get the theft of life saving medication and food. Those are sign of desperation, signs of social ills, et cetera. But I don’t get stealing things that belong to a child. A friend of mine back in the States is moving. Of course, that means that things are a bit chaotic; there are things at both houses and stuff going up at the new house and being taken down at the old one. That’s all part of moving across town. One of the things that was waiting was her daughter’s play set. It was one of those mammoth wooden ones that I’d love to have in my own backyard. It was still fully assembled at the old house with plans to move it before the old house was sold. Those plans have been scrapped. Not, of course, because they decided to abandon their daughter’s play set. 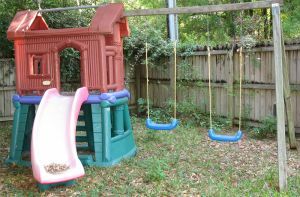 Those plans had to change because someone else decided that they needed that play set more than the family who owned it. Someone (or some people; those things are enormous) went in the yard, took it apart, and stole it. I’m a big believer in things coming back on a person. Call it karma. Call it the Biblical principle of one reaping what one sows. Either way, it comes out the same way. I suspect that the thieves will not truly benefit from this. Aside from it being an incredibly low thing to do, I imagine that the thieves will get no joy from the joy they’ve attempted to steal from that family. In fact, I’m envisioning nothing but grief. I’m hoping that the thieves who stole it experience a teachable moment for themselves and their families so that this particular behavior is not repeated. How would you turn this into a teachable moment for your child? I keep saying it, but, the more I learn about people, the more I hate them. It’s so frustrating and honestly plain infuriating when people will steal something that another person worked so hard to buy for their family or themselves. Just last week the chairs my husband and I bought a year ago on our first trip away together, were stolen. Right off of our porch to boot and while we were home! I know how upset the family must feel and the poor little one who has to experience the disappointment.